MENLO PARK, Calif., Jan. 31, 2019 /PRNewswire/ -- The competitive hiring environment is making it difficult for companies to attract top talent, which may be causing delays in the overall process. 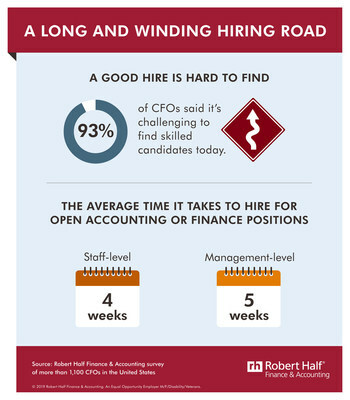 In a new Robert Half Finance & Accounting survey of CFOs, more than nine in 10 (93 percent) said it's challenging to find skilled candidates for professional-level positions. As a result, respondents said their search could take a month or more — four weeks, on average, to fill a staff-level accounting or finance position and five weeks to hire for a management-level role. View the infographic for survey details. "The hiring market, with low unemployment rates and intense competition for new employees, remains challenging for companies, often forcing them to broaden their candidate search and adjust their hiring criteria," explained Steve Saah, executive director of Robert Half Finance & Accounting. "While candidate shortages can contribute to extended hiring processes, organizations must move as quickly as possible. Top candidates have options and won't wait long for the business to make a decision." Previous Robert Half research found 69 percent of workers lose interest in a position if they don't hear back from a company within two weeks of an interview. "Ways to accelerate the hiring process include prioritizing the most critical attributes for the job rather than trying to find someone who checks every box, and working with a recruiting firm. Employers also must maintain communication with candidates to keep them engaged." Sharpen the job description. Accurately describe the skills needed for the position, but focus on three or four crucial responsibilities that top applicants must possess. Reconsider rigid requirements. A laundry list of needed skills and credentials risks eliminating excellent candidates who might require only a little additional training. Seek soft skills. Communication, attention to detail and enthusiasm for ongoing learning are attributes that help indicate long-term potential and an organizational culture fit. Predetermine hiring parameters. Make sure all approvals for the position are in place with a flexible compensation range so an offer can be made quickly to a top candidate. Consolidate interviews. Coordinate schedules with internal interviewers. If you need to bring back the candidate for a second round, aim to do so the next day. Stay in touch. Candidates can lose interest in the position if kept waiting. Be proactive when providing updates, and respond promptly if they have further questions. Work with a recruiting firm. Recruiters can help with time-consuming aspects of the hiring process and present skilled candidates for consideration in a timely manner. The online survey of CFOs was developed by Robert Half Finance & Accounting and conducted by an independent research firm. It is based on responses from more than 1,100 CFOs at U.S. companies with 20 or more employees. Founded in 1948, Robert Half Finance & Accounting, a division of Robert Half, is the world's first and largest specialized financial recruitment service. The company has more than 300 locations worldwide. For more information, visit roberthalf.com/finance, and for hiring and career advice, visit our blog.